Back in the days when I was teaching in Bangkok, I did a one-on-one tutoring with a Thai primary student, One time while reading the book Amelia Bedelia with her, I came across the dessert called lemon meringue pie. Neither of us had any idea what it was. I told her not to miss a chance if she found one. I said I would do the same and for a while it made me wonder what it's like. I didn't care much about sweets back then so the thought of it was completely forgotten. Then the most unexpected thing happened.. I made a decision to leave my university teaching job after ten long years to pursue a culinary course. Prior to attending classes, I started collecting cookbooks to help prepare myself as I had no strong background in baking. It was while browsing one of the cookbooks when I happened to see something familiar. It was lemon meringue pie! It got me excited. Would I ever learn it at the culinary school? I was going to a French school. I would be studying mostly French contemporary desserts. I doubted they would even cover the subject. I got it off my mind for the second time. I changed workplace after almost two years of working at a bakery in Bangkok. I got hired at a busy resort on Koh Samui. As the only staff at the bakery I get to make every baked goodies and desserts for breakfast, ala carte dining, and events. It's a big responsibility but an opportunity of a lifetime. I've done different stuff since I started working at the resort but it wasn't until late last year when I was asked to make lemon meringue pie for a huge birthday celebration. I had mixed feelings about it. I was thrilled knowing I would finally be able to work on the pie that fascinated me for years. At the same time I was scared. Why? Because I heard it could be tricky to make. The minute I learned about the job assigned to me, I searched the internet for a simple recipe that was tested by many. As I had expected, the recipe from allrecipes.com appeared on the screen. I browsed more recipes and spent a good amount of time reading the reviews for each. I went for a recipe that had the most positive reviews. 2. Place milk, water and half of sugar in a large saucepan. On medium heat, bring to a boil. 3. In a separate bowl, beat egg yolks and the remaining sugar until pale. Sift the flour mixture over the eggs. Continue mixing until blended. Stir in the lemon juice. 4. When water/milk mixture comes to a boil, slowly add a small amount of it into the eggyolk and continue whisking the mixture as you do this. The heat will cook the eggs. Pour the egg mixture back to the saucepan. Continue cooking until thickened. Be sure you stir it constantly to avoid it from sticking to the saucepan. 5. Remove from heat once cooked. Stir in the butter. Pour into a baked pie crust. 6. To make the meringue, whip egg whites until foamy. Gradually add sugar and continue whisking until stiff peaks form. 7. Spread meringue over pie. Make sure the meringue touches the edges as this will seal it. 8. 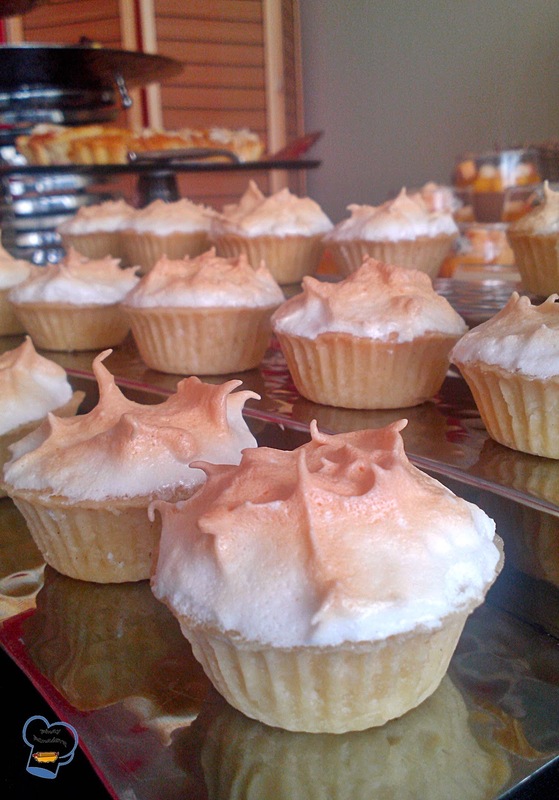 Bake in a preheated 175 C oven for 10 minutes or until meringue is golden brown. Cool completely before chilling. Taste wise the lemon curd was lovely. It had enough sweetness and tartness. The only thing I wasn't happy about was the consistency. It was oozing out when sliced. I was expecting a jelly like consistency. I even let it sit on an ice bath for hours but that didn't help. I think I would try omitting cornflour and adding gelatine next time I make it. I made extra curd in case the boss wanted them for brunch. And surely she did. 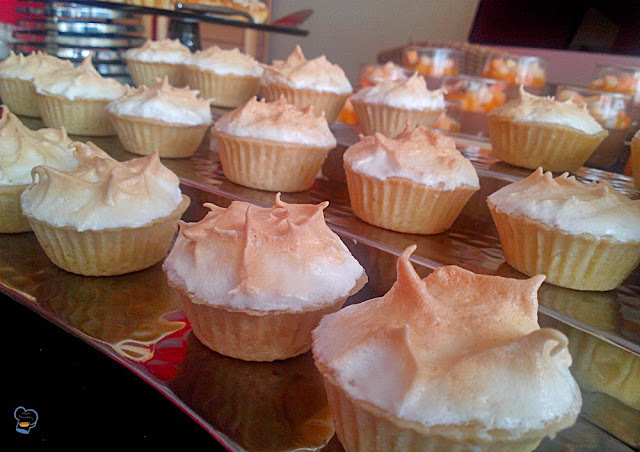 I opted to make mini ones to avoid a mess at the dessert room.